In honor of Autism Awareness Month, I’ll be talking about the stigma around autism and how we, as a community, can get rid of that stigma altogether. The key to understanding anything is knowledge. People tend to have a fear of the unknown or what they cannot explain, but if you educate yourself enough to understand something it can create a very different outlook. I read a quote by Wilson Kanadi awhile back that makes perfect sense: “Those who judge will never understand, and those who understand will never judge”. So let’s step back, and look at things from a different perspective. Though the law may see autism as a disability it is not. 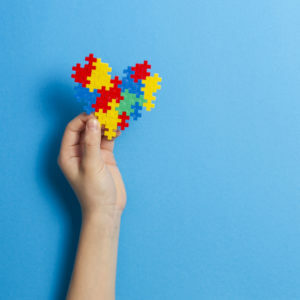 Autism, as defined by Autism Speaks, refers to a broad range of conditions characterized by challenges with social skills, repetitive behaviors, speech, and nonverbal communications. There is not just one type of autism so every single person who is diagnosed with autism have their own challenges. Some people with autism become dependent for support while others can live independently. While there are multiple causes for autism, vaccines are not one of them. There is evidence from the last two decades that determines vaccines do not cause autism. Please visit the American Academy of Pediatrics for a list of all the compiled research. It is imperative that people understand that there is not one specific way of knowing if someone has autism. When meeting someone with autism, it’s important that you remain patient and understanding, just like you would with anyone else. As Dr. Stephen Shore said, “If you’ve met one person with autism, you’ve met one person with autism”. It is as simple as that. To break the stigma on Autism Sesame Street took the first step! In 2017, Sesame Street introduced a new character to their show, Julia. The first Muppet with autism! How amazing is that! This year, Julia and her family, are hitting the big screen on a regular basis! The idea is to promote “new perspectives and resources for families”. Everyone is different in their own way, but we still deserve the same kindness and love. Sesame Street is trying to promote exactly that! While we all might be a little different, we’re still the same too. TO break the stigma around autism, this is what we want to express and understand. Props to Sesame Street on being the first show to take such a huge step in breaking the stigma around autism! Remember to watch or record Sesame Street on April 8th where they will air the special segment with Julia and her family. If you’re looking for resources on Autism, Sesame Street has created a page directly for that. If you have a chance, visit it! There some great videos for kids and parents! Visit www.autismspeaks.org for an extensive overview of autism or ways the become involved in your community. See the amazing ways you can be of help! If you have any relevant information to add or would love to share your thoughts, please comment below.